The majestic effect of natural stone on residential homes simply can’t be overstated. There is probably no other cladding material in use today that so powerfully summons up images of permanence, value, integrity and natural beauty. Resonant with historical overtones – think medieval castles, French countryside villas and colonial field stone farmhouses – yet versatile enough to fit in with the most contemporary and transitional of architecture, stone can be used to spectacular effect to accent chimneys, cover exposed foundations and add grandeur to exterior walls. However, the prohibitive cost of transporting and installing stone – not to mention the material’s considerable weight, which can stress walls – has placed it out of reach for many homeowners. Thanks to recent advances in technology, stone veneers can be added to your home’s exterior for a fraction of the cost of conventional full stone. These veneers are available in both natural stone and “cast” stone; the latter, also referred to as molded stone, faux stone, architectural stone and manufactured stone, is composed of a mixture of cement, aggregate and iron oxide pigments. Cast stone veneers can be purchased as individual “stones” or in pre-designed panels. Increasingly authentic-looking, these cement-based cast stones,may feature striations, swirls, infused colors and other natural accents that allow them to rival the natural, organic beauty of the real thing. Of course, natural stone – stone that has been quarried – adds a protective element to your house that stone veneers can’t duplicate. However, when it comes to enhancing the appearance of your home, durable cast stone veneers can perform nearly as well, and have the advantage of being much cheaper to purchase and install. Like natural stone, both natural stone veneers and cast stone veneers can add considerably to the value of your home. In order to protect the veneer from seeping moisture, a tar paper, asphalt felt paper or other weather-resistant barrier must first be attached to the exterior wall. This is usually followed by a layer of self-furring galvanized lath, over which a ½ – ¾” scratch coat of mortar is applied. After a 24-hour drying period, the stone is attached and secured with type-S mortar, then grouted by using a grout bag and more mortar. With conventional grouting, the material in the joints is“raked” to achieve a neat, consistent level and appearance. 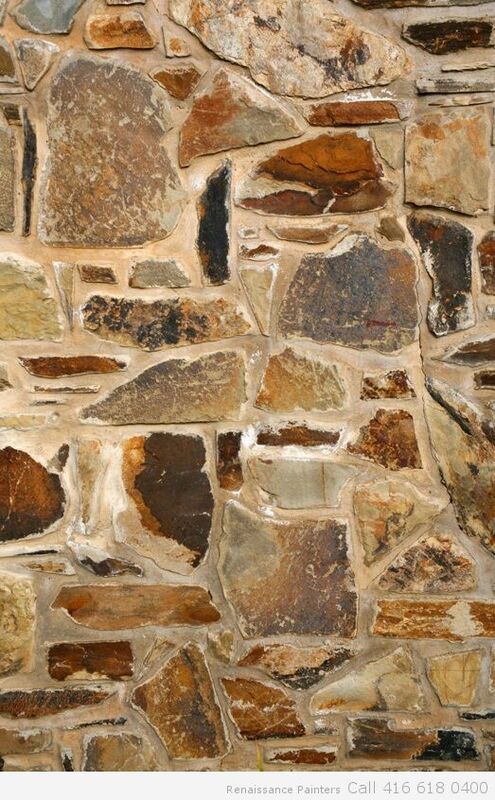 In a technique known as over-grouting, mortar is allowed to protrude past the level of the stones for a more irregular, rustic and handcrafted look. With “dry stacking,” no mortar is required; the stones are precisely stacked, in the manner of interlocking puzzle pieces. 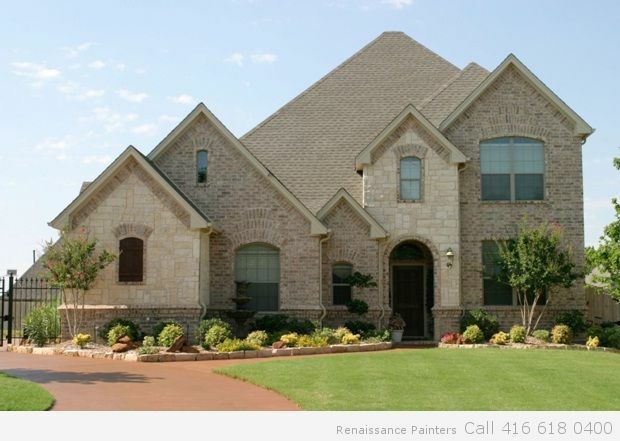 Unless you have considerable masonry or tile-laying experience, most experts recommend leaving exterior stone veneer installation to the professionals. Stone veneers come in two pricing units: corners and flat pieces. To estimate the cost, you will need to add the expected price of your corner pieces – figured in linear feet – to the expected cost of your flat pieces, which are normally figured in square feet. Figure the height of all your corners, factoring in an additional fifteen percent for improper cuts or breakage, and multiply that total by your price for linear foot. Then, figure the dimension of all walls you need to cover, remembering to exclude areas taken up by doors and windows. Add on an additional 15 percent for wastage, then multiply that amount by the cost per square foot. Adding the linear and square foot costs together should give you your total cost. Of course, the amount of mortar you plan to use between stones will affect the number of stones you should order. Most stone is packaged and sold assuming that you will use a ½-inch mortar joint; if you or your contractors plan to have larger joints, or to overgrout, you will need less stone.By the same token, planning to use the dry stack method means you will require more stones. The routine care and maintenance of stone veneers is fairly simple; regular rinsing with a hose is usually all that is necessary. To remove efflorescence — the crystalline deposits of dried salts that occasionally form in response to moisture — it is permissible to use a mixture of 5 parts water to 1 part white vinegar, applied with a bristle brush. Avoid the use of harsh acidic cleaners and power washers. There is nothing like the look of proud columns or imposing walls of stone to make you feel as if you are truly living in a modern-day castle. With proper care, your stone veneers should last for the lifetime of your home, making you the lord, or lady, of your manor for many years to come. Enjoy! Molly Hilton is the owner of Renaissance Painters in Toronto and has devoted more than 30 years to home renovation, painting, and custom home building. Her unique design concepts bring homes to life with colours and unique pieces that are artfully placed to draw attention to the most powerful and distinctive features of a home.